What Supplies Do I Need for Nursing School? Students attending nursing school often think about textbooks without thinking about the other supplies needed for nursing school. While you will spend a good portion of your time working with professors in the classroom, you will also spend some time working with patients as you complete your clinical rotations and doing projects with other students. Writing down a checklist of everything you need and checking each item off your list ensures that you have the right supplies for each year you remain in the program. As a nursing student, you need textbooks for each of your classes. Instead of buying books from your campus bookstore, you can save money when you rent your books. You usually get the books a few weeks before classes start and mail back the books at the end of the semester. Renting books can cost half as much as buying would. In addition to textbooks, you also need a medical dictionary and a drug dictionary. A drug dictionary gives you a complete listing of all prescribed drugs and any potential side effects. A medical dictionary goes over different diseases and the symptoms of those illnesses. The supplies needed for nursing school vary based on where you are in your studies. Once you reach the later part of your education, you will need at least one pair of non-slip shoes and at least one pair of scrubs. When you complete your clinical rotations, you will spend hours working in medical facilities and working with patients. Some facilities require that you wear shoes that are completely white. There may be rules regarding the scrub colors that you wear, too. Most students purchase multiple pairs of scrubs to wear throughout the week. As a nursing student, you must also have medical equipment at your disposal. Some colleges let you purchase those supplies and equipment through the school itself, but other colleges require that you buy the items on your own. You need a durable penlight that lets you examine patients and see inside their noses, mouths and ears. Penlights rely on AA or AAA batteries or come with a rechargeable battery. You will also need your own stethoscope that lets you listen to a patient’s heartbeat. Some programs also require that you have your own reflex hammer. The technology used in nursing programs changes frequently, but having a tablet at your disposal helps you keep up with those changes. A good tablet lets you download programs that you can use when studying for the nursing licensing examination. You can also edit and view documents and projects that you create for your classes. According to Tucker Cummings, nursing school students can find good tablets for around $300. Some students may find that a smartphone works just as well as a tablet. As more medical facilities now use tablets in place of computers, buying a tablet gives you experience and familiarity with the technology used by those facilities. 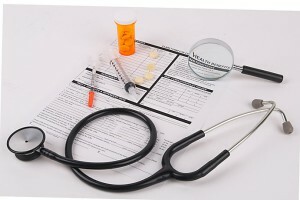 While textbooks are important, students enrolled in nursing programs also need other supplies. You will use those supplies both in the classroom and when working with patients. Some of the supplies needed for nursing school now include a tablet and/or smartphone, medical equipment, scrubs, shoes, textbooks and medical books. Please also see: How Can I Save Money in Nursing School?